"I'm devastated by this," writes Thomas Weller, also know as "The Highwayman," in a August 23 email. Weller will likely remain devastated until he finds a witness to an accident he was involved in, one that will keep him from helping stranded motorists as he has done for more than 40 years. On August 10, Weller went looking for stranded motorists in his 1955 Ford Wagon. As he merged onto SR 163 from Interstate-5, Weller and his border collie copilot, Shela, were involved in an accident. Weller says Beulah, the name of his wagon which bears an uncanny resemblance to the Ghostbusters' "Ecto-1," is likely totaled. During the past two years, The Highwayman has encountered some rough terrain. Last year, an ophthalmologist detected a cataract in one of Weller's eyes. Around the same time, he found that Beulah's engine was in need of an overhaul. 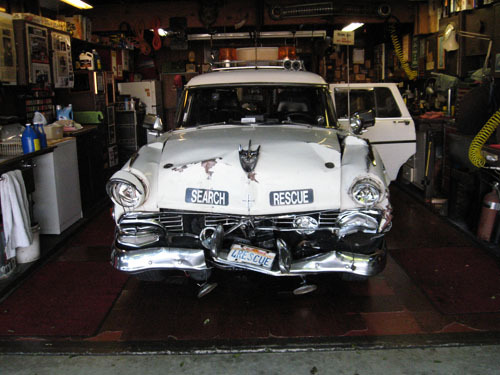 Through donations, Weller's vision was repaired, and with help from the San Diego Automotive Museum, his rig was repaired as well. And now Weller is hoping for another good deed, an eyewitness willing to set the record straight about the accident. "I really need a witness to the accident that [can] give an account of what happened. [If not], I'm going to be found at fault for hittin' a vehicle from the rear." Mommas_Girl Aug. 29, 2011 @ 10:03 a.m. I find it humorous that this story made it to print. However, I have to simply think that everyone has the right to their version of what happened. I look forward to seeing if there is a witness out there that will take his side on this issue. MarkS Aug. 29, 2011 @ 1:33 p.m. Here's your witness, you were driving too fast, not paying attention to the road, you rear ended a white Honda, then a white Infiniti, then a tan Ford... If you had been paying attention and not trying to read your text messages you could have stopped in time and not sent two of drivers to the hospital... As you stated at the scene, 'I know traffic gets backed up here this time of day (2:42pm), it's totally my fault' So now why are you yet again seeking public support? You didn't even have enough insurance to cover the damages you caused? Maybe it's time you got off the roads, you certainly didn't help anyone that day! Mommas_Girl Aug. 29, 2011 @ 3:28 p.m. Shotgun Shela Aug. 30, 2011 @ 7:39 a.m.
You are NOT a "witness"! You ARE, however, posting second hand, inaccurate, and deliberately FALSE information on a public forum. This constitutes libel & slander. MarkS Aug. 30, 2011 @ 10:46 a.m.
Highwayman you are correct there was some inaccurate information and I apologize, It was a White Acura you rear ended first, then you rear ended a White Infiniti which was pushed into a Light Brown Mazda. It happened at approx 2:02pm. There is no proof you were in fact distracted by your phone, but I stand by everything else I said. You were found at fault, cited in the police report for excessive speed for the road conditions, gotta love the Freedom of Information Act. Had Dorian reviewed the police report first she might not have bothered publishing this piece to begin with. Instead of seeking public sympathy and support why don't you man up and admit you made a mistake and then take stock of what caused you rear end those cars, there wasn't 'fluid' on the road and nobody else caused it - you did!!! As long as you deny culpability it’s a good thing you and ‘Beulah’ are off the road as you are a danger to the motoring public!!! Shotgun Shela Aug. 30, 2011 @ 4:21 p.m.
"MarkS" givin the content of your first post, I'd say your credibility level is O and no, I don't accept your "apology" for your inflamatory false statements and pretending to be a "witness" -- goes to character -- as I said before YOU are NOT a witness! accident reports are public record -- but you DO have to buy them from the issuing agency -- question is -- why would you have one? Mommas_Girl Aug. 31, 2011 @ 6:21 a.m.
Mr. Highwayman, YOUR credibility is shot!!! Just because someone got simply facts mixed doesn't take away from YOU being at fault. YOU are seeking help for something that was YOUR fault. YOU should just leave well enough alone. HuskerGirl Aug. 30, 2011 @ 11:04 a.m.
Mr. Highwayman, I would also like to note that in your blog you also fail to mention that two people were hurt and taken by ambulance to local hospitals because of your negligance as stated in the police report. Once again in that forum the whole truth is not coming out either. I would suggest that you consider telling the whole truth before you continue to ask for handouts as some of your loyal supporters might not be too happy with your story embellishments. Facebook Aug. 30, 2011 @ 2:47 p.m.
Jarin Udom: On a related note, whatever happened to fact checking? M. E. Aug. 31, 2011 @ 12:59 p.m.
What in the post is inaccurate? Mommas_Girl Aug. 30, 2011 @ 2:55 p.m.
You Highwayman need to learn to tell the truth. You are a witness to your own accident so just admit your faults and move on. Facebook Aug. 30, 2011 @ 9:22 p.m.
Valerie Young: Yeah this needs to be taken down without all the facts. About fifteen years ago he pulled one of my friends over like he was a cop to warn him about speeding. Enough with this public support. Your fault fix it yourself like everyone else has to. Equalizer Aug. 31, 2011 @ 9:11 a.m.
What is obvious to most intelligent observant readers is that the first two blog comments here are written by one and the same troll, using two different usernames. Check the dates of username registration, the semantics and punctuation style. Once that is determined, then consider the source of what tripe content 'they' may post here as extremely questionable. Often on online websites one person may make several usernames in an attempt to try to support his own attention-seeking tripe statements. Moderators are advised to check those IPs and remove the offenders posts as double registrations are violation of terms here and on most other sites. Equal. tomjohnston Aug. 31, 2011 @ 11:13 a.m.
"Moderators are advised to check those IPs and remove the offenders posts as double registrations are violation of terms here and on most other sites"
Actually, I don't believe the reader has any such restrictions in their tos. SurfPuppy619 Aug. 31, 2011 @ 11:32 a.m. Many people post under multiple handes at he SAME time. We knwo that. I have never pasted under multiple handles at the same time. wellerbee Nov. 22, 2012 @ 9:21 p.m. The questions are typically followed by a statement of "that person could have a gun", or "what if you ran a red light and somebody yelled at you?" The answer to those have always been that I would hope they don't have a gun or at least are not ridiculous enough to try and use it, but I 100% would welcome and expect anybody to yell at me if I ran a red light. I firmly believe that we need to both keep our citizens in check and also help every person we possibly can within our power. In doing this, we all grow closer as a community. I would hope that Dorian posted the article as witness to maybe one or a few of the literally thousands apon thousands of Thomas Weller's gifted good deeds. Of course we are going to hear from the occasional person that believes they should have not been told by anyone that they need to stop at red lights, or not drive on someones bumper, or drive recklessly, or hit their girlfriend, and the many other things that people think go unseen or cared about. Just like most news, we seem to only hear about the bad and not enough about the good. The good, is that there are men like my dad, Thomas Weller, that have been instilling good-will and helping others for over 40 years. That even though we could pay millions to put thousands more law enforcement officials out there, it really comes down to communities holding themselves accountable and helping each other. Thomas Weller knows, believes, preaches, and practices that every day possible and with a little help from the community, he has been able to keep doing it. The bad is that accidents do occur and often involve individuals that are the most prepared. Unfortunately the point and request in the article, is that a witness was being sought after, and I doubt at this time that any are going to be able to step forward. Shotgun Shela April 16, 2013 @ 3:27 p.m.
My "WITNESS" statement IS -- that the first car struck passed me on my right, then unexpectedly changed lanes suddenly into my lane directly in front of me and braked hard at the exact moment I glanced to my left, THIS was the first WHUMP -- this impact sheared my brake line to my master cylinder [ discovered upon investigation after ] disabling my brakes, which is why I couldn't avoid hitting the second car -- I was NOT in a hurry, I was NOT speeding, I was moving "with the flow of traffic" I was NOT "texting on my cellphone" nor doing ANYTHING with my cellphone -- I WAS payin close attention as this is one of THE most dangerous traffic locations in all of San Diego. Shotgun Shela April 16, 2013 @ 3:31 p.m.
Now, to respond to comments made here -- by "MarkS"
First off, NOTHING was asked for here except that an uninvolved witness come forward to give testimony. MarkS - in yer first post, you are a LIER! YOU sure backed up in a hurry on that one didn't ya!? all I can say bout you, fella, is "the apple doesn't fall too far from the tree"
I thereupon returned to my now destroyed vehicle and retrieved my first response bag to obtain instant cold packs from it that I activated one and placed it on the back of that driver's neck w instructions as to how to activate the second one if needed while waiting . Shotgun Shela April 16, 2013 @ 3:33 p.m. In speakin w the driver of the first car on the phone, next day, 08/11/11, I asked what type of car her's was - that driver answered, and I QUOTE -- "an Acura TL type S -- the EXPENSIVE one!" She then asked me -- "is your vehicle a company vehicle? do you own a company? I'll leave this to a reasonable person's conclusions ----------- I've never caused an a TC [ Traffic Collision ] IN MY LIFE and I sure as hell didn't cause THIS one! Shotgun Shela April 16, 2013 @ 5:36 p.m. Shotgun Shela March 1, 2015 @ 3:25 p.m.
To "MommasGirl" I am sorry that you felt it necessary to DO this -- on Christmas Eve, no less! My brakes were disabled by that crash - [ I didn't know that at the time ] and THAT'S WHY I was inspecting the road surface after -- to see if there was something slick on it [ like spilled antifreeze from a possible eariler crash -- or some such ] I was puzzelled by my inability to avoid hitting your car, as I was NOT "speeding" at all but traveling "with the flow of traffic -- as I told you on the phone after, when I called to see if you were all right, i'm sorry you were involved - damaged because of the first drivers "SID" Selfish Ignorant Driving behaviour :( but I was NOT the cause* of this crash -- SHE was! AGIN - I'm sorry you felt it necessary to DO what you DID on the EVE of my birthday no less!! I didn't get much sleep that night -- wonderin?? and THEN, I woke up Christmas mornin and saw why channel 10 ran the story -- THANK YOU Channel 10! I think you, Vicky, have held your mistaken angst for too long -- I forgive you. Shotgun Shela March 10, 2015 @ 6:55 a.m. Shotgun Shela March 1, 2015 @ 3:34 p.m. Shotgun Shela June 8, 2015 @ 5:52 p.m.
THAT'S the car that CAUSED this accident! Now ask yerself this -- HOW did IT get THERE?! and NOT be beTWEEN the second car [ Vicki's ] and mine? Shotgun Shela June 8, 2015 @ 7:39 p.m.
http://www.coronadoclarion.net/premier-issue/the-highway-man/ Just got an e-mail update from the man who's bringin my "Beulah" back from the dead -- she MAY be "ON THE ROAD AGIN" by August! that comes about, it'll have been 4 years since she was killed on the transistion from I-5 NB to SR 163 NB downtown -- I'm exCITED! To hear our "travelin theme song" click on the audio bar at the bottom of this site's video photo display "Born To Be Wild"! smile emoticon Thankee kindly Allen! Shotgun Shela Sept. 21, 2015 @ 5:06 p.m. Shotgun Shela July 12, 2015 @ 6:59 p.m. Shotgun Shela July 13, 2015 @ 6:05 p.m. Shotgun Shela March 2, 2018 @ 6:29 a.m.